According to reports and a very close friend of Brad claims, Brad was drinking on the private jet when he physically abused his son. In her divorce filing, Angelina listed the duo’s date of separation as Sept. 15, a day after her husband’s alleged meltdown. The pair is parents to sons Maddox, 15, Pax, 12 and Knox, 8, as well as daughters Zahara, 11, Shiloh, 10, and Vivienne, 8. They were married in August 2014 after nine years together. Angelina Jolie had filed for divorce from Brad citing ‘irreconcilable differences’ and has asked for physical custody of the couple’s six children. “He yelled at OUr children on the plane during an argument, & crossed the line he had never crossed before by lunging and Hitting OUR 15-year-old son” Angelina JoliE explained. L.A. County Dept. of Children and Family Services is investigating after getting an anonymous tip that Brad allegedly abused and attacked his eldest son. According to sources, Angelina says this is not about alcohol, this is all about protecting their children. 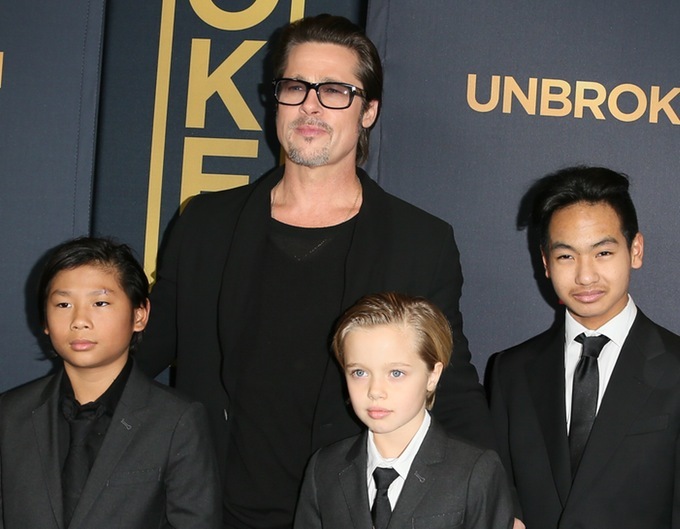 Brad has acted aggressively toward his kids in the past but verbally – and Angelina felt the incident on the plane was a deal breaker.